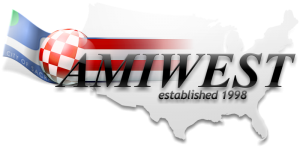 It's been a while coming but we hope to present the AmigaOne A1222 at both the AmiWest and Amiga32 shows later this month. 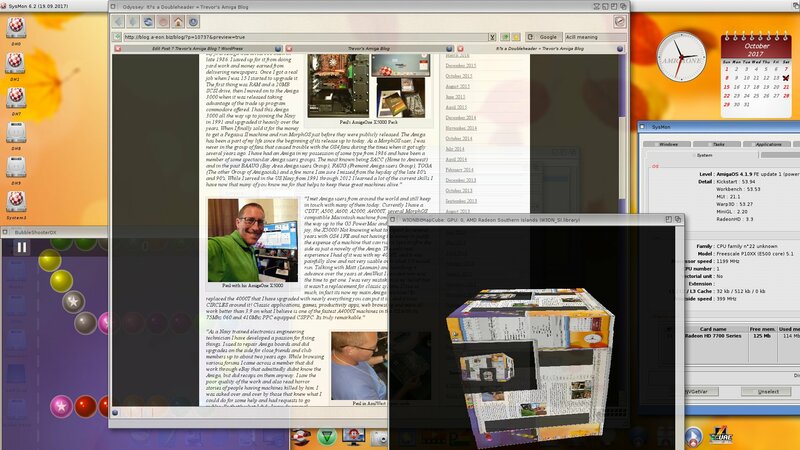 Actually, the A1222 has been displayed running Debian PowerPC Linux at numerous Amiga shows over the past two years. 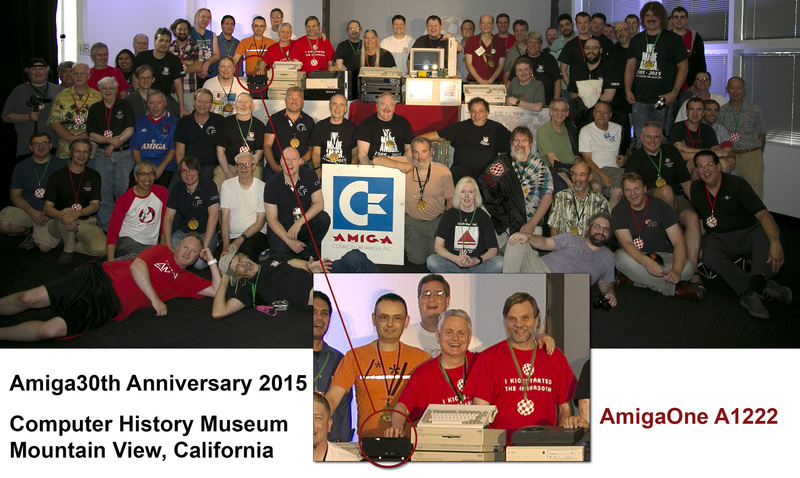 The machine also made a sneak appearance in the Amiga family group photo taken at the Amiga30th Anniversary celebrations at the Computer History Museum in Mountain View, California in 2015. I even had a video of AmigaOS4.1 running on the A1222 playing under Linux on the A1222 at VCF SE 5.0 retro show in Roswell, Georgia in April this year. This time however, the plan is to show AmigaOS 4.1 running on the AmigaOne A1222 in a live public demonstration for the first time. Although there is still some work needed to done on audio and Ethernet drivers before the AmigaOne A1222 can be commercially released, the FPU optimization appears to be progressing well. As a test, I decided to write this blog on my AmigaOne A1222 using the latest version of the Odyssey web browser. Odyssey handles the WordPress dashboard quite well although not everything works perfectly. Resizing images after they have been inserted is a bit problematic under Odyssey but apart from that, most other operations appear to work OK. Was the A1222 up to the task? Apart from the hassle resizing images, which is common to all AmigaOS 4.1 machines, I was pleasantly surprised by the A1222's performance. I even managed to grab a short video of the AmigaOne A1222 in action. Now let's just get the commercial version released! "I grew up in Santa Clara, Ca. 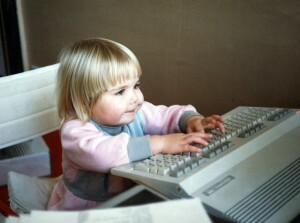 and was exposed to computers at an early age. My first Amiga was an A1000 back in late 1986. I saved up for it from doing yard work and money earned from delivering newspapers. Once I got a real job when I was 15 I started to upgrade it. The first thing was RAM and a 20MB SCSI drive, then I moved on to the Amiga 3000 when it was released taking advantage of the trade up program commodore offered. I had this Amiga 3000 all the way up to joining the Navy in 1991 and upgraded it heavily over the years. When I finally sold it for the money to get a Pegasus II machine and run MorphOS just before they were publicly released. The Amiga has been a part of my life since the beginning of its release up to today. As a MorphOS user, I was never in the group of fans that caused trouble with the OS4 fans during the times when it got ugly several years ago. I have had an Amiga in my possession of some type from 1986 and have been a member of some spectacular Amiga users groups. The most known being SACC (Home to Amiwest) and in the past BAAUG (Bay Area Amiga users Group), FAUG (Fremont Amiga users Group), TOGA (The other Group of Amigaoids) and a few more I am sure I missed from the heyday of the late 80's and 90's. While I served in the US Navy from 1991 through 2012 I learned a lot of the current skills I have now that many of you know me for that helps to keep these great machines alive." 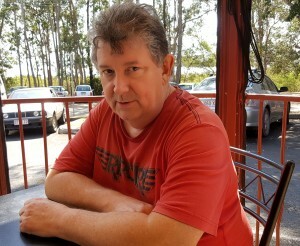 "I met Amiga users from around the world and still keep in touch with many of them today. Currently I have a CDTV, A500, A600, A2000, A4000T, several MorphOS compatible Macintosh machine from G4 PowerBooks all the way up to the G5 PowerMac and my new pride and joy, the X5000! Not knowing what to expect for several years with OS4.1FE and not having the money to justify the expense of a machine that can run it I put it off to the side as just a novelty of the Amiga. The only real experience I had of it was with my 4000T, and it was painfully slow and not very usable over what 3.9 would run. Talking with Matt (Leaman) and watching it advance over the years at AmiWest I decided now was the time to get one. I was very mistaken in my belief that it wasn't a replacement for classic systems I love so much, in fact its now my main Amiga machine! Its replaced the 4000T that I have upgraded with nearly everything you can put it in, and it runs CIRCLES around it! Classic applications, games, productivity apps, web browsing and more all work better than 3.9 on what I believe is one of the fastest A4000T machines in the US with its 75Mhz 060 and 410Mhz PPC equipped CSPPC. Its truly remarkable." "As a Navy trained electronics engineering technician I have developed a passion for fixing things. I used to repair Amiga boards and did upgrades on the side for close friends and club members up to about two years ago. While browsing various forums I came across a member that did work through eBay that admittedly didn't know the Amiga, but did recaps on them anyway. I saw the poor quality of the work and also read horror stories of people having machines killed by him. I was asked over and over by those that knew what I could do for some help and had requests to go public. So that's what I did. I now do several systems, game consoles and of course the Amiga on the side in my spare time. Getting them done can be slow since I travel a lot for my full-time job, but I treat every board I get as my own. They come out like new once I give them the "Acill" treatment and I love the praise and support I get for doing them. I try to keep my costs as low as I can so I can pass it on. Usually I break even on parts, but I love to do it and love the thanks in return!" Now that what I call a true Amigan. Thank you Paul for sharing your Amiga journey. "Saku 2017 was held on 30th of September in Oulu. The event got good publicity with a local major newspaper showing Amiga 1200 on 'events this weekend' - page. 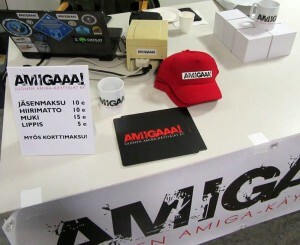 The total number of visitors is hard to calculate as the event was open from 2PM to 12PM so total 10 hours of Amiga. Anyway more than 70 persons wrote in the guest book, so probably the total amount of visitors was around 150 people. 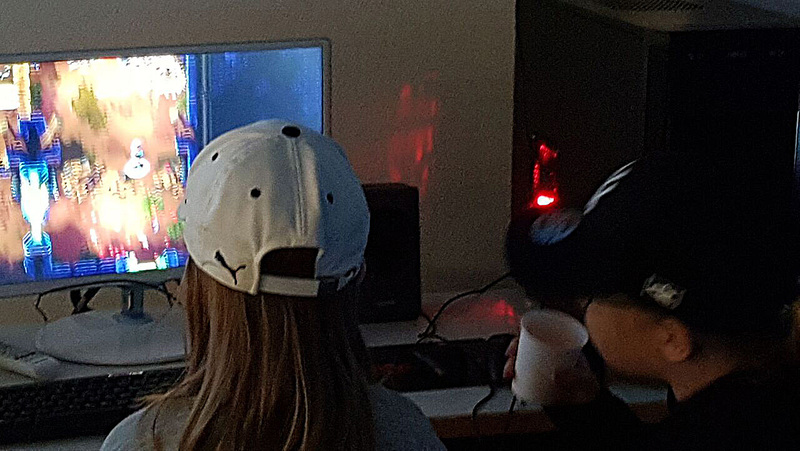 What was nice - lots of families and children enjoying classic Amiga games and of course latest demos of Tower 57 and Wings Remastered. Lots of new things were shown - the AmigaOne x5000 first time in a public event in Finland, new version of MorphOS (3.10) and FPGA powered MIST and Vampire V2+ on Amiga 2000. There was also an Amiga 4000 running five graphics cards and five monitors, just awesome. Lots of children enjoyed games like Lotus2, Superfrog, Stunt Car Racer, Skidmarks and Sensible Soccer. The Sensible Soccer tournament was arranged later in the evening with really good prizes too (shirts). The tight tournament ended with challenges for a re-match for the next year (I lost the final 2-0 😉 What was especially nice was to see so many young players enjoying Amiga games. Especially Tower57 was successfully played as a 2-player for a looong time by two young girls. Other NG games that people seemed to enjoy were Voxel Bird and M.A.C.E. Beside the gaming, the Viva Amiga - documentary was shown, what a great movie, it's just like watching one hour long Amiga trailer 🙂 Lots of current and past Amiga developers were visiting the event, main organisers being jPV guy responsible of new RNO - apps and Mr. Octamed Teijo Kinnunen (who joined me for couple of beers after the event (was it called AAA on your blog ;-))." Thanks for the SAKU show report Tapio. It's good to know that the Amigan triple-A effect is alive and well in Finland. OK I admit it's probably a bit over dramatic! 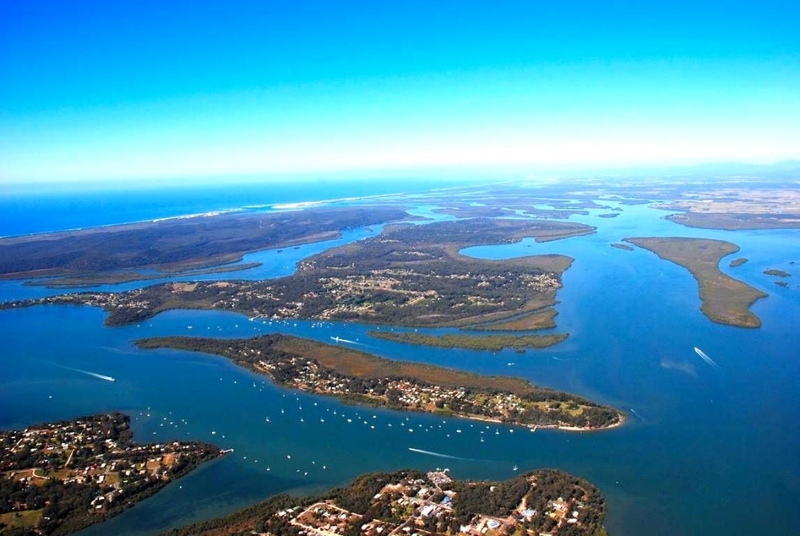 Traveling to Russell Island off the coast of Brisbane in Queensland, Australia to meet Colin Wenzel, the main AmigaDOS developer cannot be compared to Stanley's historic meeting with Dr David Livingstone on the shores of Lake Tanganyika in 1869. "Dr. Livingstone, I presume?" Livingstone responded, "Yes", and then "I feel thankful that I am here to welcome you." I don't think Tony Wyatt or me said anything quite so profound or memorable when we met Colin on his island retreat for the first time. 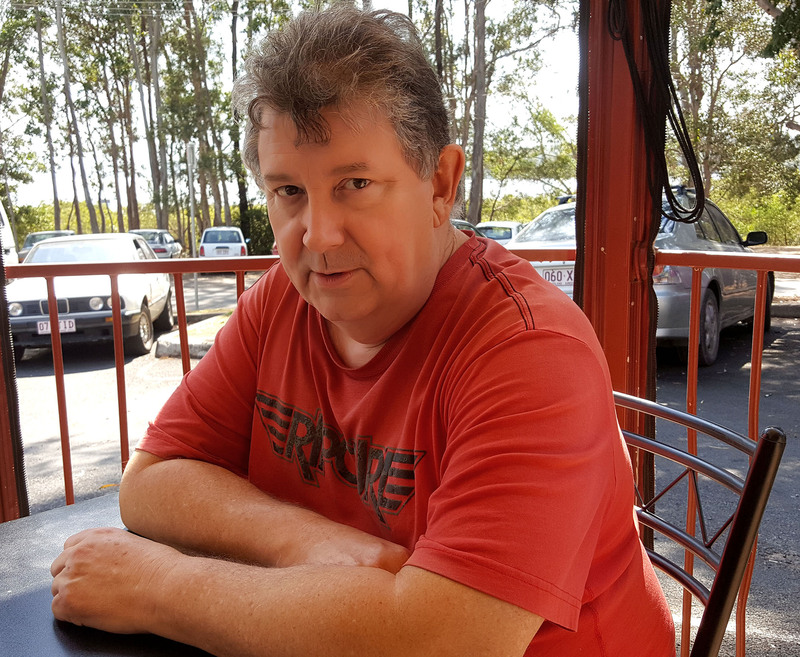 If you have followed the development of AmigaOS 4 you will know that Tony Wyatt is a very active developer and beta tester with a string of AmigaOS 4 developments to his name. 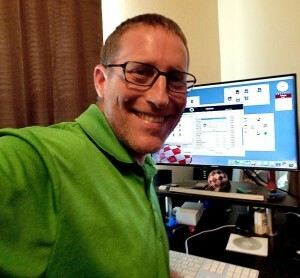 Colin, on the other hand, has earned the deserved reputation as the leading AmigaDOS guru following the evolution of AmigaOS 4.1. What were we doing at Colin's island hideaway you might ask?. Tony came up with the idea that we should upgrade Colin's AmigaOS4.1 developer experience with a shiny new AmigaOne X5000 system. 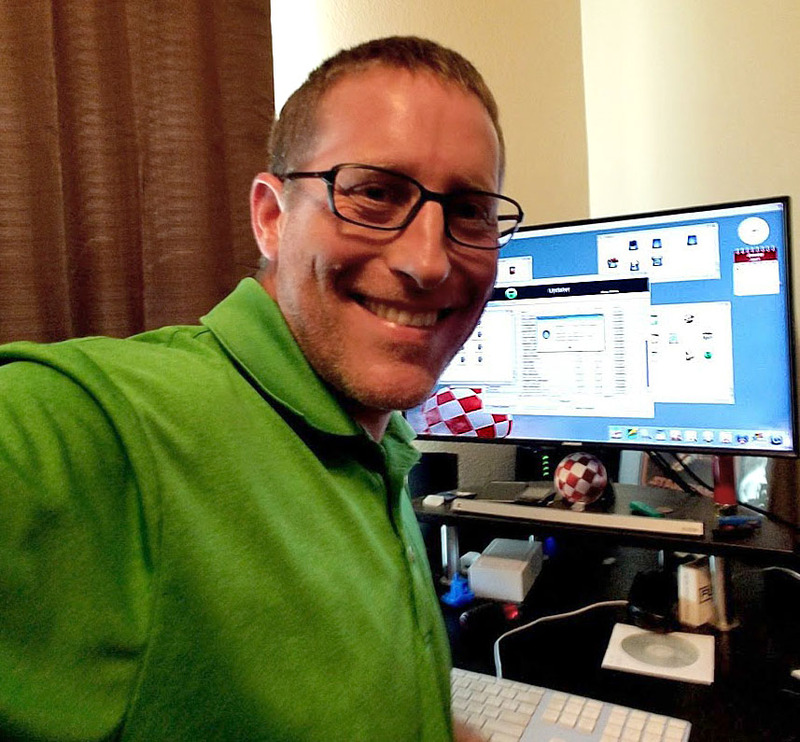 Like most AmigaOS developers, Colin set his system up years ago and does all of his development work on a very slow system compared to the AmigaOne X1000 & X5000 AmigaOS 4 powerhouses now available. This is not a unique phenomena. For many years Tony himself used an aging A1-XE system for all his development work, even after he acquired his AmigaOne X1000 system in 2012. However, a few years ago he finally moved his development over to the X1000 and was truly amazed by the transformation. So much so that he now claims the AmigaOne X1000 is the best Amiga ever made. (that is until he moves his development system to the X5000 in a couple of years time ;-)). Anyway, Tony knew that Colin would benefit from a similar AmigaOS developer epiphany. 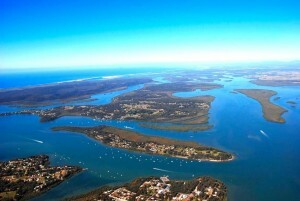 So we ordered a Cyrus Plus P5020 motherboard from A-EON and planned the trip to Russell Island. 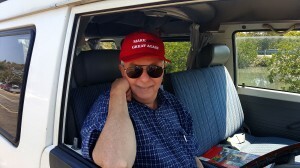 Tony made the long drive 922Km (523 miles) drive from Sydney to Brisbane in Maccas**, his heaving customised minivan which he has driven all over Australia. I had the shorter and less stressful four hour flight from Wellington to Brisbane and Tony met me at the airport for our short 45 minute drive to Redland Bay where we were picking up the car ferry for the ~1 hour trip to Russell Island.On arrival, our instructions were to drive directly to Colin's house. 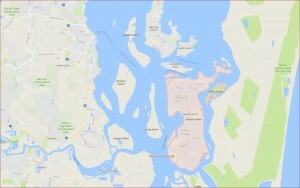 The Island is only 8 km long and 3 km wide and with one central road it was only a 5 minute ride to Colin's house set among native trees in a heavily wooded area. After we made our introductions we got straight down to Amiga business. 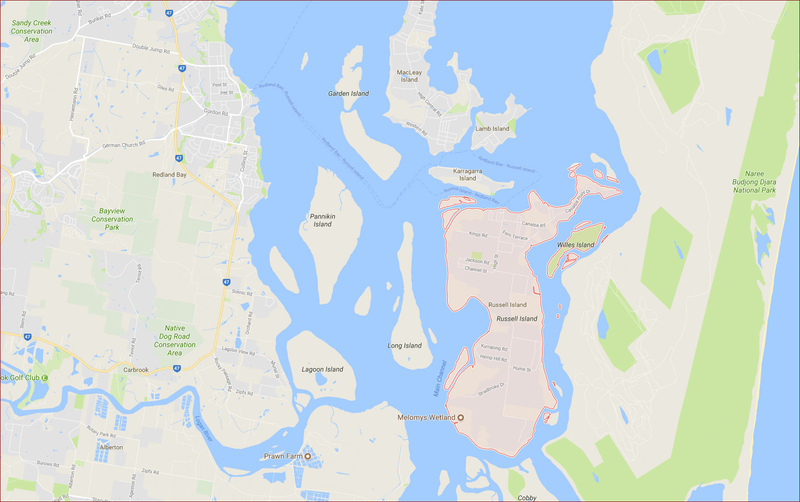 Unfortunately, due to the "remoteness" of Colin's island, the DHL Express service could not guarantee the board would arrive before our visit and of course it didn't! 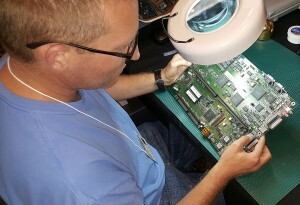 Tony had anticipated this outcome and had brought along his Cyrus Plus motherboard which he had installed in an old PC case to give Tony a demonstration of the X5000 in action. 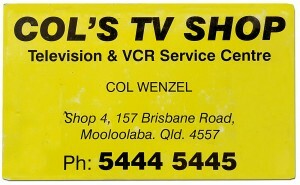 The internet speed and capacity on Russell Island is very low but Colin was keen to try the Odyssey web browser playing Youtube videos, something he can't really do with his current system. 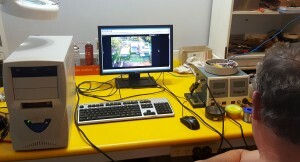 Having passed the Youtube test, Colin gave us an online tour of the Island's houses via several real estate websites. He followed that up with a drive around the whole island which of course didn't take very long and in the evening treated us to a very tasty Chinese meal and a few drinks while we chatted about the Amiga's past, present and future. Colin has a very interesting background. 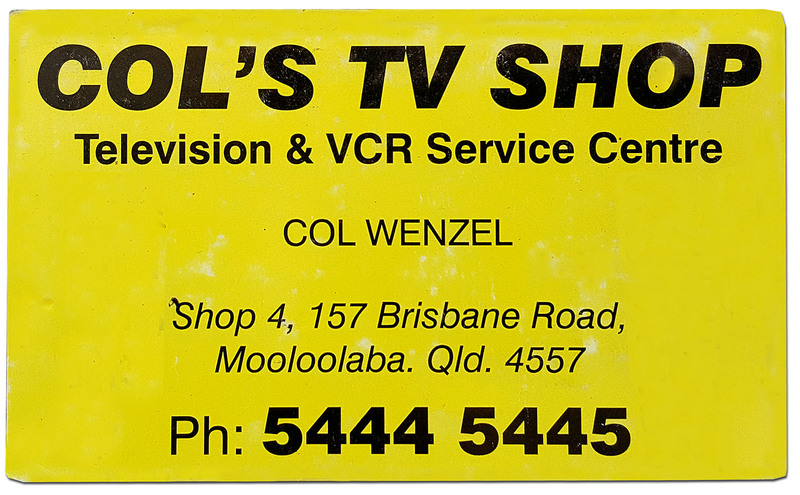 For many years he ran his own business, COL's TV Shop, a TV & VCR sales and repair center in Mooloolaba on Australia's Sunshine Coast about 100 km north of Brisbane. As an early Amigan he found himself setting up or repairing Amigas for his friends although it was not a part of his main business, it certainly grew over time. He got into AmigaDOS programming almost by accident and taught himself the coding skills which would prove so valuable later on. Eventually, after a health scare, he decided to retire from his day job and move to the tranquil peace and quiet of Russell Island with its full time population of less than 2,000 inhabitants, although tourists and day-trippers like Tony and I swell those numbers. When he first moved, his was the only house on the block. 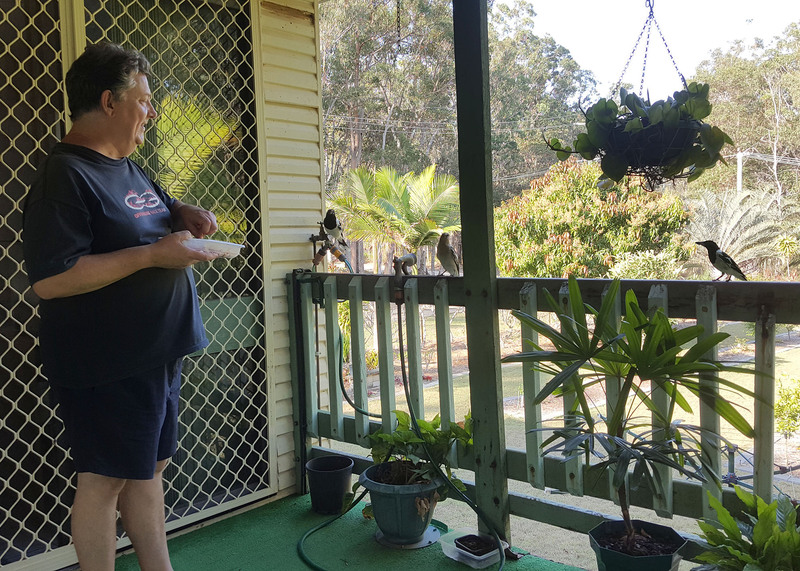 He does have a few neighbors now but is still completely surrounded by native Australian flora and fauna and every day he feeds raw meat to the kookaburras, magpies and other birds who turn up for their daily treat. As a self trained coder, he became involved with AmigaOS 4 very early on and wanted a project he could get his teeth into. Someone (Olaf Barthel?) suggested AmigaDOS needed to be converted from 68K to PowerPC and the rest is history. 15 years later he is now the acclaimed OS4 AmigaDOS expert. Colin's skill does not stop at programming and as an electronics engineer he designs and builds his own circuit boards for marine fishing net locator buoys. 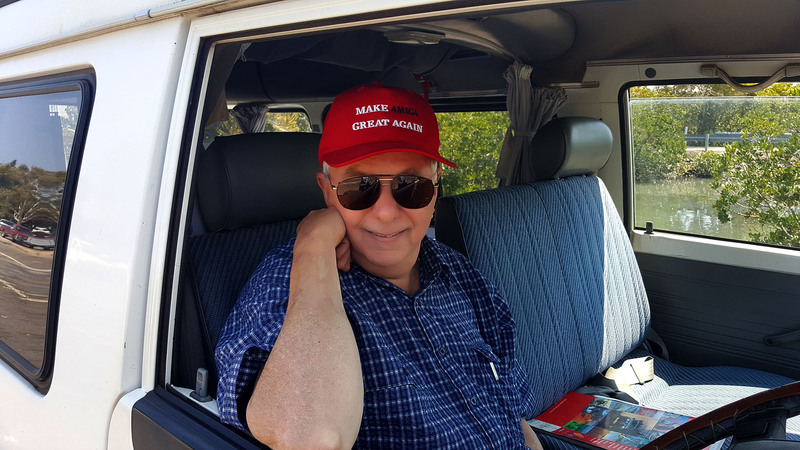 "Maccas was conceived in 1995 when we were on holiday in Alice Springs in a Nissan van (two-wheel drive) and I decided that I was going to build my own four-wheel drive campervan, since there were so many places in the outback that we could not go without four-wheel drive. 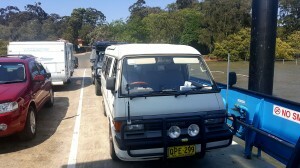 I bought a long-wheelbase two-wheel drive van (fairly new) and an older short-wheelbase four-wheel drive van. 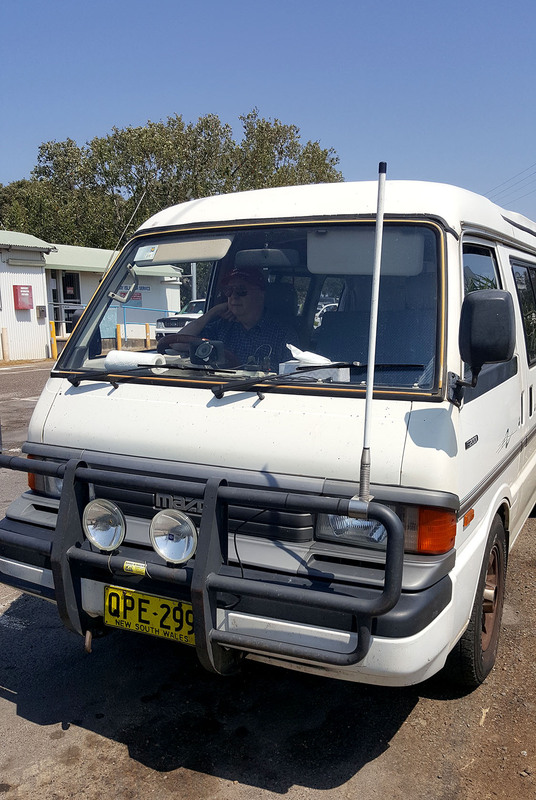 With the advice, guidance and eventual approval of a local licenced engineer, I swapped the running gear between the two vans and sold the short-wheelbase van as two-wheel drive. The project was originally called "The Macrobus" (as distinct from a VW "Microbus"), but the name was soon abbreviated to "Maccas". Maccas took all of 1996 to build and was first registered in December 1996. Maccas has his own home-designed and built fuel injection (my hardware and software) and his own transmission (I had to join the gearbox and transfer case together with a custom adaptor section). 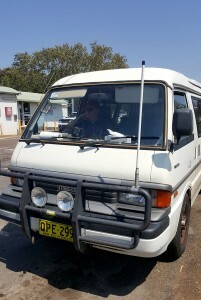 His cabin section/living area runs off 24 volts, which feeds the lights, fridge, water pump, microwave and a DC-DC inverter to keep the vehicle battery charged. The fridge runs off 12/24/240V, auto switched. The microwave contains my own electronics. There is also a 1 kW 240 VAC inverter/24V 50A battery charger. There are several small computers in the bus - one for the engine control, one for the User Interface on the dashboard, one for the four-wheel drive actuator (electronically controlled, of course). Each device uses a Motorola 68HC11 micro. These micros are mounted on small PCBs and sold by a guy in New Zealand for minimal cost. I use them everywhere. I code for them in C or assembler, the compiler runs under Windows but I use my "luggable" Sam 440 to upload code to the CPUs and/or capture debug information." 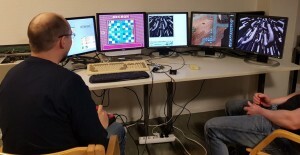 When you scratch the surface of any Amigan you soon realise the unique and talented people like Paul, Tony and Colin who were drawn to the Amiga scene and, even better they are still contributing to its continued development and survival. Long may it continue. Four years ago I was interviewed for the inaugural edition of Retro Planet, a new Greek language magazine completely devoted to retro computing. I can't believe the last four years have passed so quickly. 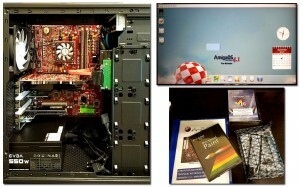 It seems only yesterday that AmigaKit shipped the first commercial AmigaOne X1000 system in December 2011 following a successful beta test programme. 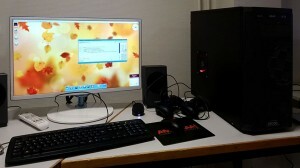 The AmigaOne X5000 began shipping late last year and the new entry level AmigaOne A1222 machine is not far behind. Over the same period the focus of A-EON Technology has shifted to include more software content to support the hardware that is being developed. The Retro Planet interview was probably the first really in-depth interview I had given up to that point. It ran to almost 6K words and covered may topics including a discussion about the high NRE costs associated with small volume development and manufacturing. 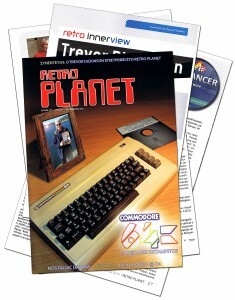 Although the magazine is printed in Greek, an English language translation was later posted on the Retro Planet website. The new interview follows the same in-depth format as the original and again runs to over 5K words. If you don't speak Greek I'm sure the producers of Retro Planet will again post an English language version in the future. Just your usual Linux desktops? I am just amazed by the sheer volume of work that the key members of our core Linux team get through. Almost every day they are generating new kernel builds for our hardware, creating updated Linux PowerPC distributions and contributing the greater Linux cause. 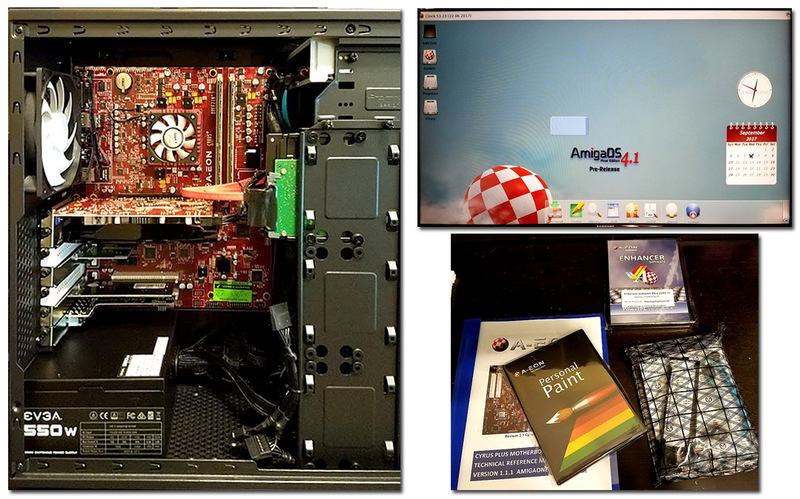 While our AmigaOne hardware is designed for the AmigaOS it's good to know that it is also helping to support the ongoing development of Linux PowerPC distributions. I'm writing this update as I await the arrival of my first grandchild. The birth was due last Sunday and, at the moment, it does not look like the baby will arrive before I leave for San Francisco on Wednesday. 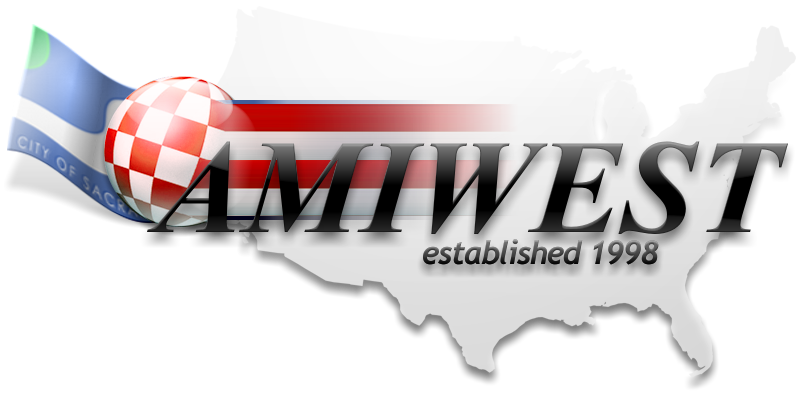 Fortunately I have a very understanding wife & daughter and they have given me clearance to travel to Amiwest and Amiga32. I would expect nothing else really as both my daughters grew up using Commodore and Amiga computers. 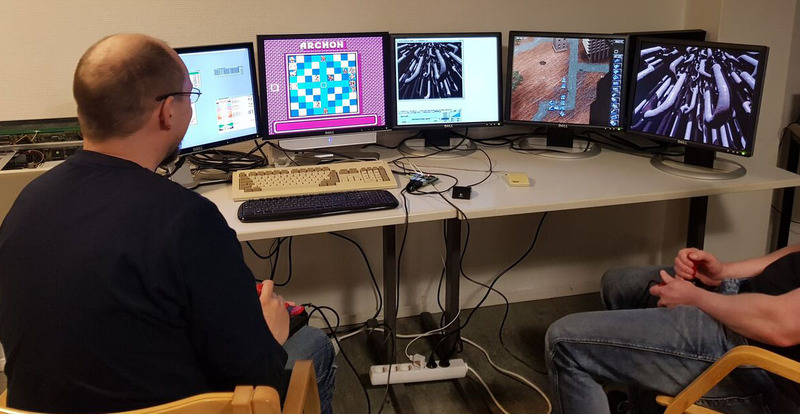 They played learning games on the C64, completed their high school work on an Amiga A2000 and went back to playing games on an Amiga CD32. 😉 Rachel wrote the special boot sounds and music for the AmigaOne X1000 & X5000 as well as music and sound effects for several animations and demos.